Perak is the Malay term for silver, referring to the colour of the state's abundant supply of tin. Perak's tin was discovered in 1848, bringing wealth but also violence, foreign invaders and a population drain when the mining industry declined. Relative stability was gained when Malaysia became independent in 1957. Perak was one of the federation's richest states until the 1980s, when worldwide tin prices fell and the tin mines were abandoned, forcing the state to diversify. It became the biggest maker of Proton cars, the national automobile brand. However, tin mining is now being revived, as prices are rising. The state capital of Ipoh, nestled in the Kinta Valley among limestone hills rich in tin deposits, is not a big tourist draw, but it has many local attractions, including a new water park and old temples built within the hills. Ipoh is also a top producer of bougainvilleas. Ipoh's huge Chinese population have made the state famous for their flat rice noodles, sar hor fun. 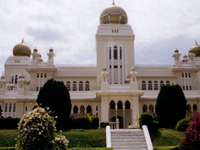 Among its several colonial buildings, Ipoh's most prominent structure is its elegant Railway Station, with its British Raj-style architecture with Moorish elements. Near Ipoh is the town of Tambun, known for its sweet variety of the citrus fruit, pomelo. Around 50 kilometres away from Ipoh to the north is the royal capital of Kuala Kangsar, a quiet town located at the bend of the Perak River. The royal homes and mosque are located on Bukit Chandan, at some distance from the centre of the town and bordered by a park. The state was born when the Portuguese conquered Malacca in 1511, and its royal rulers moved to Johor. The sultan's eldest son went north and became Perak's sultan in 1528. To this day, Perak is the only Malay state whose royalty can claim direct lineage from Malacca's royal house. The discovery of ancient tools in Perak's Lenggong Valley reveal that the area was inhabited by Stone Age settlers between 35,000 to 60,000 years ago. �Inside a Lenggong cave, the famous 11,000-year-old "Perak Man" was discovered in 1991, then Malaysia's oldest complete human skeleton. His bones now reside in a museum in Lenggong. In 2008, among the mangroves near Perak's former capital, Taiping, archaeologists discovered even more complete skeletons of two separate groups of Neolithic humans. Perak is also the home of the Orang Asli, the aboriginal people of the Malay Peninsula.